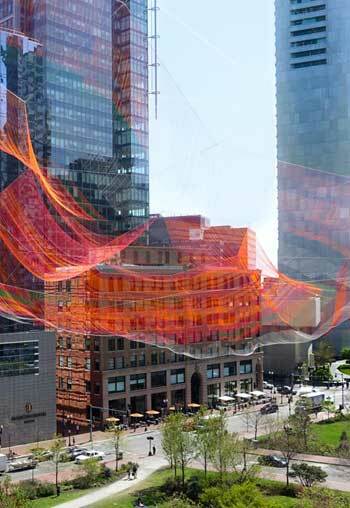 A grand new work of knots and colored rope from artist Janet Echelman floats 350 feet above the Rose Fitzgerald Kennedy Greenway in downtown Boston. Commissioned by the Greenway Conservancy, the piece’s name — “As If It Were Already Here” — is as enigmatic as the art work itself. Echelman, who recently won the Smithsonian American Ingenuity Award, is a remarkable sculptor of massive floating net installations and frequent collaborator with landscape architects. This new mesh work in Boston, her home town, is some 600 feet long, 2,000 pounds, and is comprised of 100 miles of fibrous twine 15 times stronger than steel set into a pattern only made possible through a half million hand-made knots. 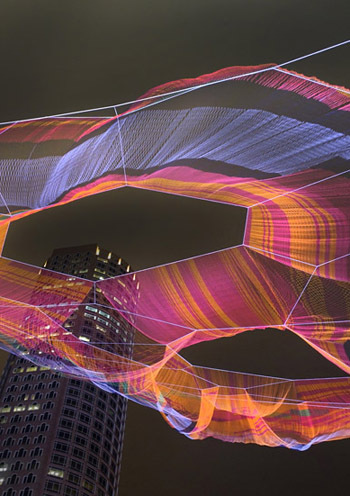 As with another recent piece in Seattle for the 30th TED conference, Echelman is increasingly lacing interactive technologies into her sculptural experiences. In Seattle, visitors could use a smart phone app to paint lines across the sinuous surface of her piece. 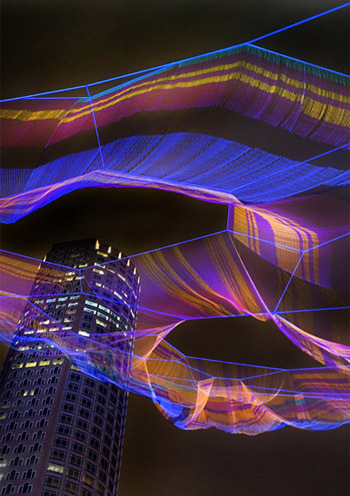 Here in Boston, this new piece, which cost some $1.25 million, uses “dynamic light elements” that react with the wind. “Sensors register movement and tension, manifesting data into the color of light projected onto the sculpture’s surface,” explains Wallpaper magazine. 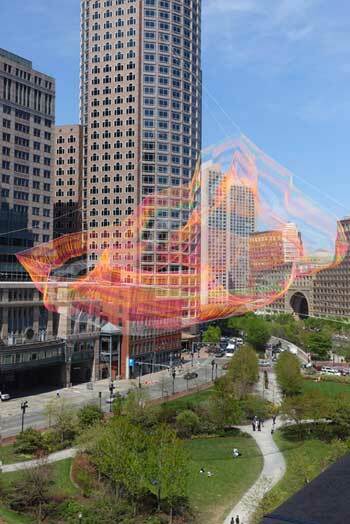 Echelman’s artwork hangs over the Fort Point Channel section of the 1.5-mile long greenway, which was tacked onto the notorious “Big Dig” project that replaced an elevated highway that cut through downtown Boston with an underground one. While the greenway is certainly better than the elevated highway, there have been numerous complaints over the years about the success of the urban design, largely because its many segmented parks are still separated from the city by 2-lane streets on either side. In a recent tour of the greenway, Christoper Hume, architecture critic for The Toronto Star, called it a “failure of the city and landscape architecture in general,” pointing out that few people seem to want to spend any time there. And Cathleen McGuigan, editor of Architectural Record, who was also underwhelmed, wondered “where can you sit?,” pointing to the dearth of public benches along the linear park. Go see it before it comes down in October. Absolutely stunning. 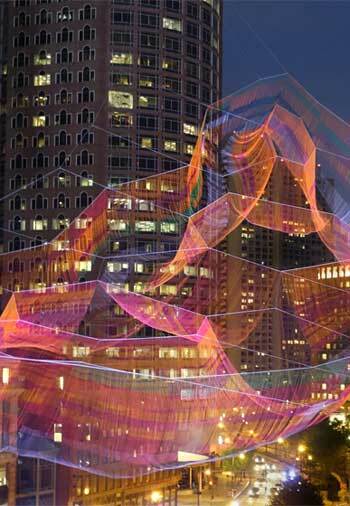 I can only imagine how breathtaking it would be to walk under this piece, especially at night. Thanks for sharing these beautiful pictures!